The latest release of Talent 360 includes an innovative, strengths-based presentation of 360-degree feedback results, using a ‘word cloud’. This word cloud is the latest development in Head Light’s drive to make 360 review results more meaningful to and instantly accessible by participants. The word cloud makes 360 review results instantly accessible, meaningful and actionable by those taking part in 360-degree feedback programmes. 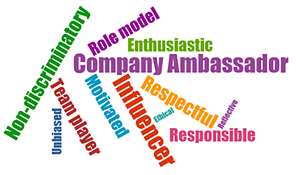 The new word cloud functionality comes as standard within the Talent 360 system and all users are able to access this following the latest upgrade. Ian Lee-Emery concludes, “This is yet another example of how we are moving 360 software forward and re-emphasises that all 360 degree feedback systems are simply not the same. Talent Cloud® Version 8.8 is now available to all clients. For more information or to see for yourself how Talent Cloud® works, do get in touch with us.